Our BosPure® Boswellia is a gum resin produced from the boswellia serrate plant, also known as Indian Frankincense. The herb has been used for thousands of years in traditional Ayurveda. Bospure® is standardized to 75% total organic acids along with 3 specific boswellic acids: (AKBA) Acetyl-11-Keto-Boswellic Acid (10%), Acetyl-alpha-Boswellic Acid and Acetyl-beta-Boswellic Acid. The synergism of these components makes it a comprehensive extract to provide inflammatory support and pain management. Best of all, this potent, Non-GMO, product is made in the USA in our certified cGMP Facility. What are Acetyl-group Boswellic Acids? AKBA, along with the other acetyl-group Boswellic Acids are the active compounds in BosPure® that inhibit the inflammatory pathway 5-LOX. Inhibiting this pathway prevents the breakdown of joints by leukotrienes which are associated with inflammation. Other extracts only contain 1-2% of these potent compounds. BosPure contains NO beta-boswellic acid which is also present in other extracts up to 30% and has been shown to be proinflammatory. 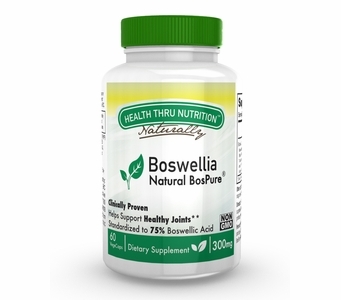 Conventional boswellia may only provide temporarily relief while BosPure®’s effect is long-lasting. As with for all of our products, we choose highest quality, purity, and clinically proven materials to ensure efficacy, safety, and best value for our customers. BosPure® has been clinically studied in conjunction with BCM95® (curcumin) as a safer alternative for chronic joint issues. BCM95® works in synergy with BosPure® as a COX-inhibitor and also works to provide inflammatory support with no known side effects (Molecular Medicine Reports 8: 1542-1548, 2013). BosPure® and Curcu-Gel BCM95® have been clinically studied for joint and mobility issues. Best of all, the combination of BosPure® and Curcu-Gel BCM95® may have you walking easier and for longer distances then you ever thought possible! Other Ingredients: Hypromellose, microcrystalline cellulose, magnesium stearate and silicon dioxide. Free of: milk, egg, fish, shellfish, tree nuts, wheat, peanuts and soybeans. Directions: Adults: Take one (1) capsule daily as a dietary supplement or as recommended by your healthcare professional. Storage Instructions: Keep bottle tightly closed. Store in a cool, dry place at controlled room temperature 15°C-30°C (59°F-86°F). Do not refrigerate. BosPure® is a registered trademark of Dolcas Biotech LLC. Health Thru Nutrition™ is a trademark of EPIC.